Democracy Video Player is an absolute gem of an application that has all the potential to replace Windows Media Player or Apple iTunes on your computer. The software is absolutely free and available for Windows, Mac and Linux platforms. Since it uses the popular VLC Media Player, it can play virtually all video formats from MOV to Windows Media to iPod MP4. 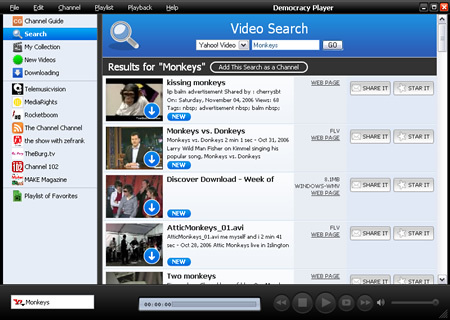 And here's a little known but extremely feature of Democracy Player that makes it unique among all other media players - you can use Democracy to search or download videos from YouTube, Google Video, Blip.tv, Revver and many other video sharing websites. You can also pause and resume video downloads. The videos can also be saved on del.icio.us, Digg, or Reddit right from within the Democracy interface. Democracy will automatically watch for new videos tagged with your keyword -- when a new video is found, it'll be automatically downloaded to your computer.